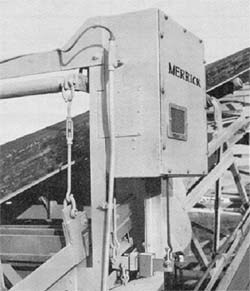 Belt Scale Modernization | MERRICK Industries, Inc.
MERRICK offers retrofit kits to upgrade any older conveyor belt scales, both mechanical and electronic. New maintenance-free weigh scale suspensions are available with no moving parts. Also, modern electronics are available for scales with working weigh suspensions. Not a MERRICK belt scale? Not a problem, we provide upgrades for all makes and models of belt scales and feeders. Model 475 or 475EZ weigh suspension to convert from mechanical to electronic technology or update an obsolete load cell based system. Genetix touchscreen process controller – Update from older electronics to the latest MERRICK Genetix touchscreen process controller with easy-to-use graphics and industrial network connectivity. High resolution belt speed sensors. Calib-Ease test weight placement systems for Model 475 belt scales. Improve accuracy – add additional weigh modules or add scale quality idler sets. Remote rate displays, totalizers, printers and chart recorders. Maintenance-free weigh suspension, no levers, pivots or bearings. Modular construction allows for easy installation. Stainless steel load cells—mechanically protected, environmentally sealed. Ease of calibration by any of 4 methods: (material test, test chain, test weights or electronic calibration).